Managing inside sales used to be quite simple. It was about dials, volume, scripts and quick closes. It was inexperienced sales reps that powered through lists and sold the same way to everybody. 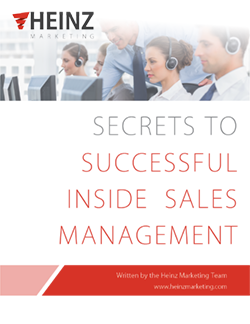 Today’s successful inside sales environments don’t look anything like that. Inside sales is rapidly replacing field sales as the primary channel for many organizations, and the quality of professionals, as well as the more complex nature of selling to today’s buyer, makes inside sales management best practices one of the linchpins of sales acceleration success for B2B companies nationwide. Smart inside sales managers are combining a traditional, metrics and activity-based approach with buyer-centric, consultative selling practices that keep energy and progress on the sales floor high, while building meaningful buyer relationships that increase closed business and revenue growth. This best practices guide will walk you through a variety of best practices, techniques and ideas to both tactically and strategically increase the efficacy, success and impact of your inside sales organization.